But what did not happen was a change in national cultures and national economic ‘shapes’. Spain still gained its growth from being a holiday country, like Greece. Germany with its remarkable engineering and high quality manufacturing enhanced its economic power within this zone, drawing to itself new markets within Europe. All went well until the credit crunch when national pressures hurt the poorer Mediterranean nations in particular, such as Greece [downgraded] and Spain [unemployment up to 20%, etc]. The rules of the Eurozone were meant to be of such force that each nation had to comply with a set of Balance of Payments criteria that would ensure a healthy economy in the face of these flows. But these rules were broken and economic pressures grown. The clash between national economic behavior of the past and these rules has not been diminished, for as always, national interests are placed before Eurozone interests. 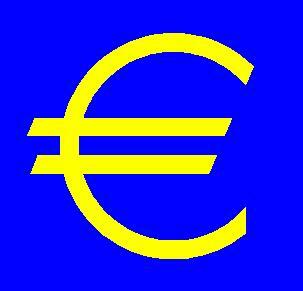 But the € in the last decade has established itself as an accepted currency having gained the confidence of its users there and abroad. Backed by 15% minimum gold levels, it is deemed a sound currency. The success of the last decade tells us that it is structurally sound. But it wasn’t until the last two years that it faced any crisis. We are told that the full reported impact of the ‘credit-crunch’ is not known, but that it is far more severe than thought. Eastern Europe’s debts are still capable of destroying European banks. Talk that Switzerland is facing unbearable strains in its banking system because of these debts abounds still. It is clear that from the European Central Bank down, institutions are struggling to cope with the crisis and rectify their balance sheets away from public eyes. Whether it will survive or not is not the point. The point is that it is visibly another ‘paper’ currency that is vulnerable just as any other is. Within the Eurozone it will survive many crises, because there is no alternative on the street. A look at Zimbabwe tells us just how far a people can be made to use a currency that has lost credibility, but outside it, its use is more sensitive and reactive to the confidence it inspires. Even at its inception doubts surrounded it. The joining of a group of nations with such a long-term divisive history stretched credibility when they vowed currency cooperation under one currency. Political action and assertiveness, when national interests were at stake, made us all feel that this Eurozone was weak. If a € crisis really struck, few doubt that national interests would overwhelm Eurozone ones. The European Parliament rulings will only be accepted when it suits each member, but what if it doesn’t? That’s why talk of Greece leaving the zone arose. Is the € under Stress? Yes, it is under stress, but not yet at a point where member nations would withdraw from the zone. It will come under more and more pressure though as the pressures facing the $ show themselves to be the same against the €. The sapping of manufacturing strength from the U.S. is also happening against Europe. These are bound to continue over time until China is the economic driving force on this globe. The Socialist nature of Europe will delay the pain. But it will come. There has to be a point when the Eurozone rules are broken to such an extent that the E.C.B. has to act against member nations. To date this has not happened because breaches of those rules have been ‘managed’, but the day when they are too great a set of breaches is on the way, then what. Will a threatened € affect the Gold Price? History shows us that the wealth structure of Europe has been as it is now for many decades if not centuries. Old money is not as patriotic as it may seem. It may not be that mobile, but the liquid portion of that money is and it is certainly not nationalistic, but pragmatic. It will find a safe home so it can survive. With the gold market a 24-hour market moves in the gold market tell us which way each one is facing. A phenomenon of the last year has been to see the Asian and Middle Eastern markets lifting the gold price ahead of Europe. Without pushing the gold price up too much you can see the vigor and lack of it during these times. More and more frequently gold price rises have begun in Asia with Europe following through. But ‘old’ money is well spread across this globe and particularly European and U.K. wealth. Nevertheless, it is apparent that gold is being favored more and more by such wealth. Europeans are at the forefront of the expected investment demand ‘poised to enter the gold market in 2010. They don’t have to wait for a € breakdown or lesser crisis, they act ahead of it. They won’t chase prices, what’s the point? They want to buy gold in volume and with such a scant supply of it, relative to paper currencies; it is too easy to chase a price up without getting the volumes you want. In fact don’t wait for any breakdown, they are unlikely to come, but the fear of them is certain to grow. So yes, a ‘threatened € will affect the gold price. What will happen to the Gold Price if the € buckles?